The evolution of the round wound series to a smooth flat wound string. The dimensional tolerance during production of these strings is held to .02 mm thus aiding to achieve perfect intonation. Thanks to the carbon alloy these strings are made with, the sound quality is very similar to that of round wound strings but with sound quality advantages (purity and clarity) typical of smooth winding. 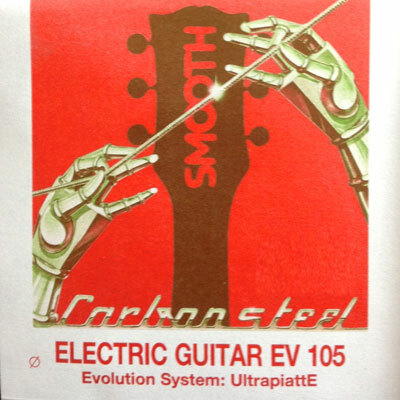 Other characteristics of the "Evolution System: Ultraflat" Series are the lack of noise during playing thanks to the smooth surface, greater ease of finger movement, as well as longer life compared to round-wound strings. Round core, with a very warm-sounding steel alloy, and consistent output across all strings. Probably because all 6 strings are wound! Yes, even the .010 high e is flatwound. Q: Are all 6 strings indeed "wound" as put forth by the Anonymous reviewer? Even the 1st (high 'e' string)? I have never heard of anything but plain steel (or plated steel) for high strings one and two. Thanks to anyone for some insight on this. A: Hello Jonathan, no they are not all wound. To indicate which string is flatwound carbon, you will see a "c" next to the listing. This set has only 3, the normal D, A and E are flatwound.